According to Movember.com, Movember is the global men’s health charity where men grow and women support the moustache during November. Participation begins once you sign up and become part of the official movement to change the face of men’s health. Movember is about bringing back the moustache (Mo), having fun, creating conversations and awareness, and raising funds for men’s health, specifically prostate cancer, testicular cancer and mental health problems. • Did you know that the average life expectancy for a man is 5 years less than most women? • 1 in 2 men will be diagnosed with cancer in their lifetime. • Nearly 1 in 3 adults in the US are obese. • 12.1% of Men over 18 are in fair to poor health. It can be said that men’s health seems to be poorer than women’s because they are less likely to openly discuss their health and how they’re feeling. They seem more reluctant to seek help when they’re feeling poorly and they tend to participate in riskier activities than women. It’s not too late to participate! Are you a MoBro or a MoSista? Click here to register, and men, start growing that ‘Stache! When folks ask you what happened to your upper lip, thank them for asking (because really, that’s the point) and tell them you care about men’s health and you’re growing it to help raise awareness and funds. 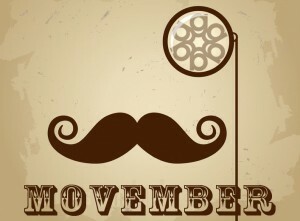 MoSistas help by promoting the importance of Men’s health, and no, they don’t have to grow a Mo! Friends can donate in your name or just to the fund itself here. The Movember folks compiled some really helpful tips for bettering men’s health. We strongly urge you to go to their site and check them out. Please post pics of your mustache on our Facebook Page and include the hashtag #GallenMovember and please get a check up soon. Happy Movember!